Ideally, users will verify their own email addresses as soon as they receive a verification email. In case they can't locate the verification message, you can resend it. Locate the user's primary email address and click the menu icon (down arrow) next to the address. Another verification email is sent to the user, so they can verify their email address. If you're an account owner, you can resend your own verification email. Click your profile icon on the upper right of the page and select View profile. 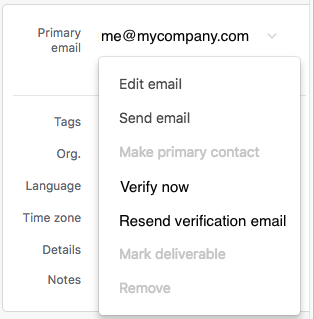 Then, open the email menu in your profile and select Resend verification email. Is there a reason that this option is greyed for all users including myself? I have verified the email address is correct and our Help Center is active. What's your user role? If you're an Admin, this link should be active (not dimmed) when you open an End-User and Agent accounts, but it will be dimmed for other Admin accounts (including your own). If you're an Account Owner, this link should be active for all accounts (including your own). How to solved the problems, I am Owner Account but the email primay verify now not active. I am wrong delete primary account email in profile. please can give me solution the case. I want to make sure I understand your question: you are the account owner on your Zendesk. You deleted the primary email on your use profile, and you need to add that email back. Is that correct? Is there a way to do a mass resend? I just launched our Help Center and need to notify our current customers to verify their email so they can login and view. You can use the API to resend verification emails -- however the endpoint requires the user ID it would require writing a script to send these in bulk. Another option would be to leverage the Customer Lists feature paired with Proactive Ticket app. With those tools you can send a message to users telling them to be sure to verify their emails so that they have access to your newly launched Help Center. I'm running into the same issue as Ryan above, and I'm not seeing resolution in this thread. I am an Administrator but I am unable to resend the verification link to an Agent (Screenshot attached). If you are having issues getting any of your user's set up, please don't hesitate to open up a ticket with us.! How do I reset my password when I can't sign in?